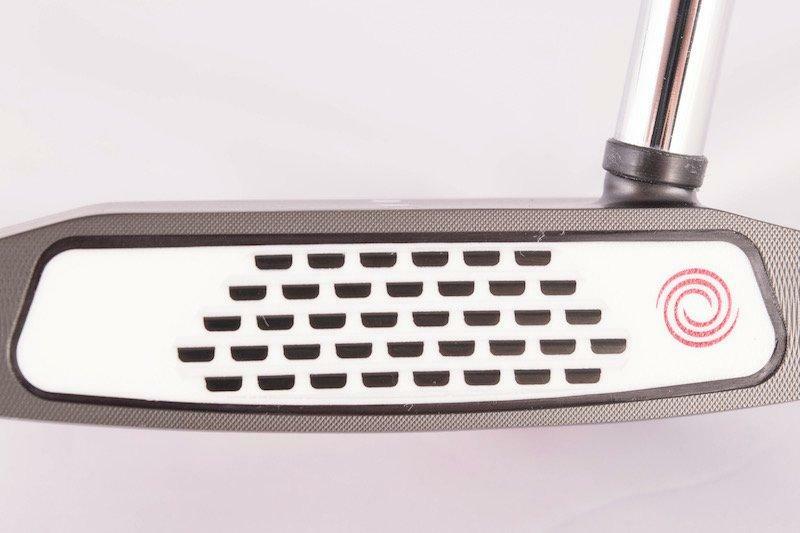 Earlier this year Odyssey announced an exciting new line of putters which takes some of their familiar shapes and offers a new technological twist. Many golfers will recognize the Rossie, 7, and Indianapolis head shapes, but they haven’t seen an Odyssey putter quite like this. To help get a better understanding of what the Odyssey Exo putters are all about, THP was able to spend time with the most famous shape of the bunch, the 7. Look around in one of the big box golf stores that has a complete line of Odyssey putters, and it’s easy to see that there are a plethora of options available. 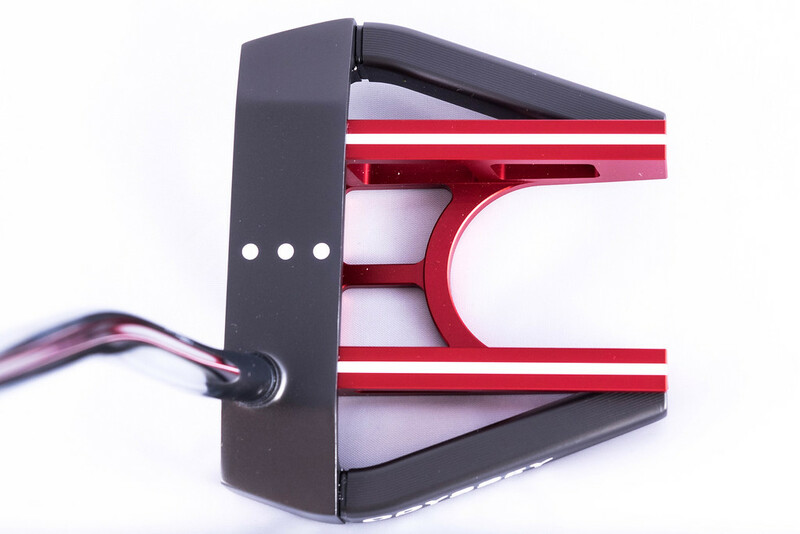 In fact, Odyssey garners one of the deepest putter lineups in golf, in part because there are so many options when it comes to face inserts, head styles, and neck options. When all of the models are lined up around a putting green, there is one thing for sure, nothing in their stable carries the looks of the new Exo line. Yes, the three shapes are familiar to the brand, with the Indianapolis being the youngster in the group, but that’s not what distinguishes the Exo from the pack. What does separate these putters is the multi-material build, which uses a heavier 17-4 stainless steel on the outer frame, while the midsection is constructed from a lighter aluminum. By choosing to go with a denser material on the outer edges of the putter, Odyssey has been able to keep unnecessary weight out of the middle, which helps give these EXO putters a higher MOI than their versions found outside of this range. To the eye, the different materials are highlighted by the use of red as the finish for the aluminum. Above all, the decision to add this pop of color helps bring attention to the build but also plays a prominent role when it comes to alignment, and of course adds that extra bit of shelf appeal. Odyssey has earned their reputation based on insert putters, with the White Hot being that stabilizing force that has been a constant in tour players bags. In a time when picture quality has become ultra-clear on televisions around the world, the fact that the white hot insert is so easy to notice is undoubtedly one of those marketing blessings for Odyssey. Last year with the introduction of the O-Works line, Odyssey lost some of that immediate noticeability to viewers because those who switched to the O-Works traded a white insert for a black-based Microhinge insert. Even with that loss, the Microhinge insert was a success because it gave amateur golfers a different feel and a sense that they were experiencing a much truer roll on the greens. 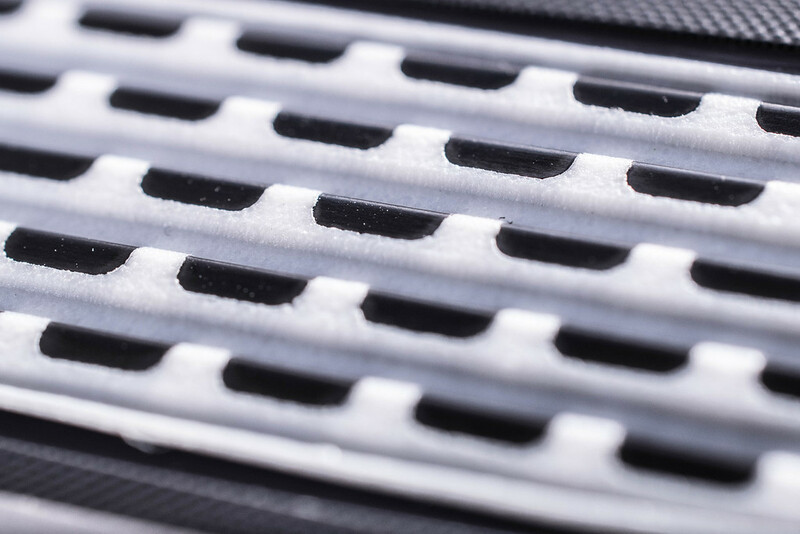 Now with the Exo, the innovation of Microhinge technology has been paired with a new white hot insert, creating a putter that will give an excellent roll, all while maintaining that legendary feel and appearance. Having played last year’s O-Works Black #7S at the tail end of the previous season, there is quite a bit of familiarity with the feel off of those putters. Even though the pure roll of the O-Works was always appreciated, that putter carried with it a feeling that just seemed slightly off to my personal preference. After just a few putts with the new Exo 7, the feel that escaped me last year was present. Audibly, the White Hot Microhinge comes in slightly higher pitched than the baritone that was the original Microhinge, but maintains a soft feeling throughout contact. Odyssey did have to make a bit of a change to the Microhinge size to accommodate the White Hot insert, so for this version, the hinges are a bit wider. Side by side, there were a few other differences where the Exo surprised. As was mentioned earlier, the two different materials help keep the weight on the outside to beef up the MOI. Not only because of the weight placement, but the pure size of the EXO 7 is more substantial, which helps make this version have over 50% more MOI from its predecessor and one very stable putter head. For many players, the putting psyche is a very fragile thing, especially when it comes to knocking in those three and four footers. As has been my experience with other high MOI designs, short putts with the EXO were handled effortlessly. 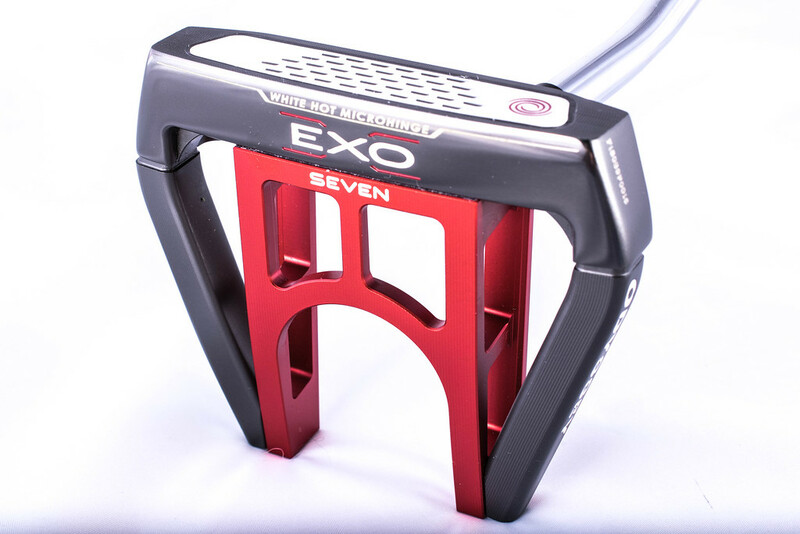 Where the Exo 7 gained an advantage over others was the ability to aim correctly to get the ball started out on the intended line. 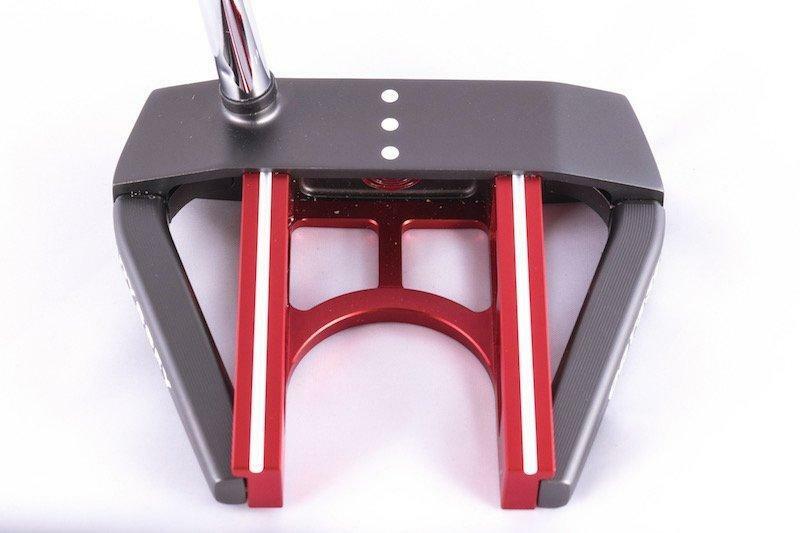 Having the red aluminum helps frame the ball and makes sure that the putter face looks square to the ball before the stroke. Even the best putters in the world understand that if their aim is just slightly off, then the chances of their putt dropping has instantly decreased. 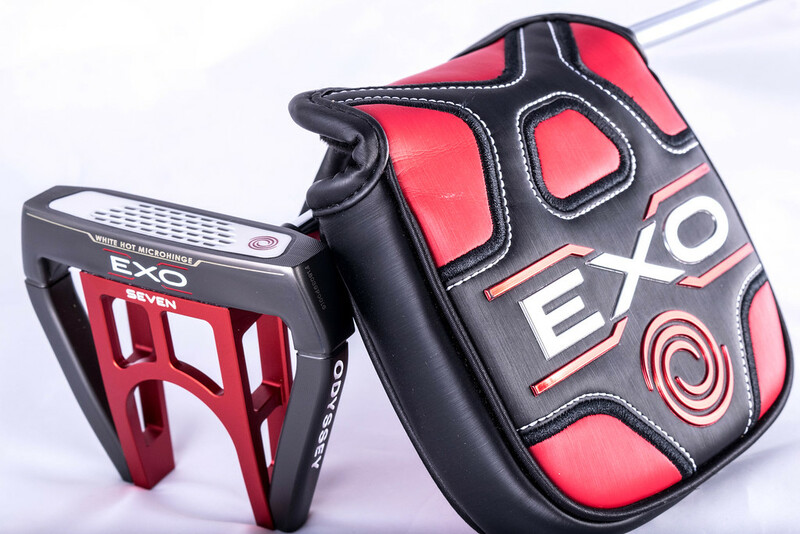 For being the first batch of Exo putters on the market, Odyssey has offered a simple, yet rewarding release. By using this line to focus on mallets and high MOI designs, they have started down a path that can seemingly expand in multiple directions. Even though there are just three head shapes, each model is available with either a short slant neck or a double bend shaft. Players who like a bit of toe hang can opt for the slant neck, while those who utilize more of a straight back, straight through stroke might be better suited for the double bend design. 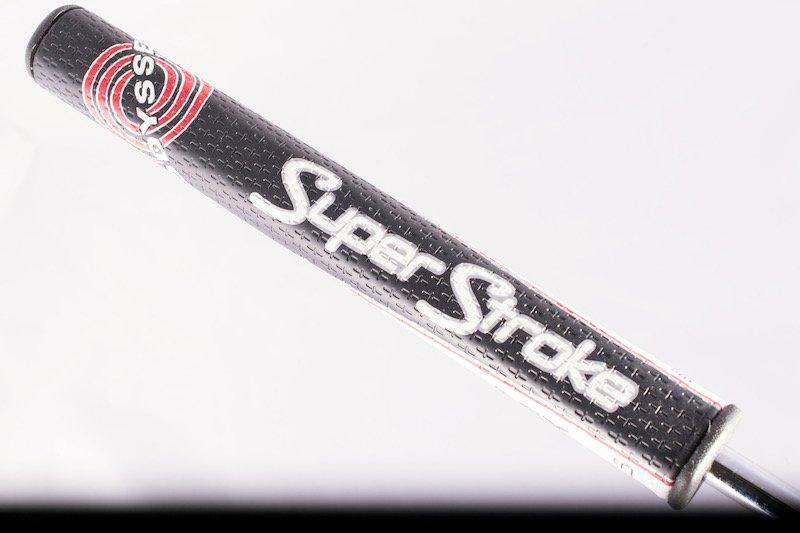 There is also a choice between regular size Winn grip or an Odyssey branded SuperStroke Mid Slim 2.0 grip. Keep in mind that choosing to go with the SuperStroke grip will add an extra twenty bucks to the purchase price. Already coming in a $299 might be a little steep for some, but considering this line is Odyssey’s high tech package, the higher price tag should be expected. 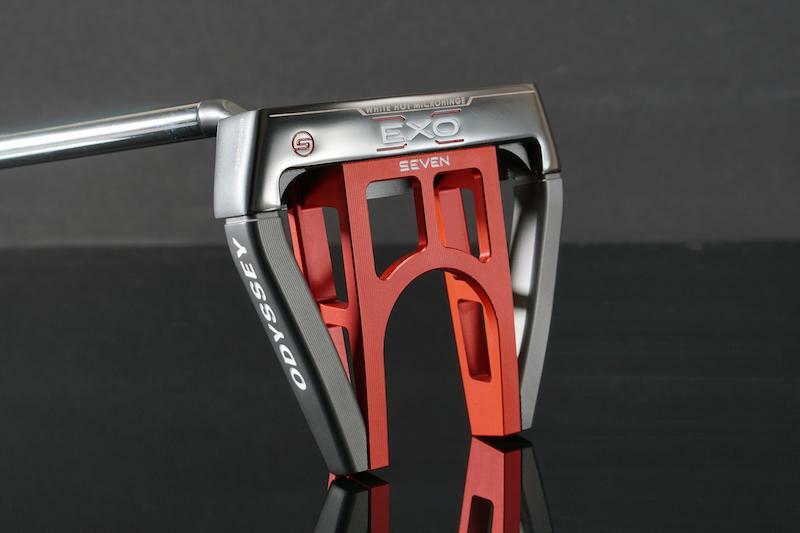 Overall the EXO 7 putter offers a very stable experience while providing an excellent roll with improved feel. Those of you out there that are still hanging on to your old White Hot putters, it might just be time to upgrade. More information on the EXO series of putters is available at www.odysseygolf.com. You can find these putters at retailers across the web including Budget Golf. Nice review Dean. In my limited time with the #7, it rolls so true and I have been lag putting much closer to the holes than previous #7s that I have used. Great job Dean! I’ve tried the older O-works putter but didn’t like the feel. Hopefully this will correct that! Thanks for the effort!! Great Review, I cant wait to roll one of these. Am using shot Scope to gather my statistics. I try to die the ball into the hole and have seen I am shot on most putts. I tried the 7 S (slant hosel) and with regular stroke I am seeing the ball get to the hole. Making more long putts(15-20 ft). Short putts are automatic. The weight of the putter helps even out my stroke and the head flows straight through the ball. Down 5strokes the first week of use! Totally worthwhile investment for anything that drops my score 8 to 10 strokes per round. The 7S, WILL change your game!